Homemade Brownie TipsThis page contains homemade brownie tips. 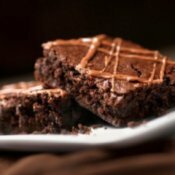 Brownies are simple and delicious to make at home without a packaged mix. Growing OnionsThis is a guide about growing onions. With over 600 varieties of onions grown internationally, this versatile vegetable is a staple ingredient in a multitude of recipes and has been used in natural remedies the world over. 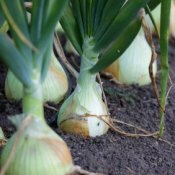 Learning to grow your own onions can also be fun and save money! 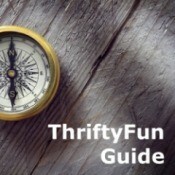 Planning a Frugal WeddingThis is a guide about planning a frugal wedding. Money is tight for many people and wedding costs can easily get out of hand. There are many ways to keep the costs down and still have a nice wedding. 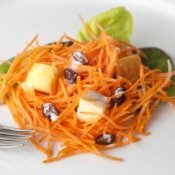 Recipes Using CarrotsThis page contains recipes using carrots. Carrots are a great source of beta carotene. They are a good side dish or tasty when added to a variety of recipes. 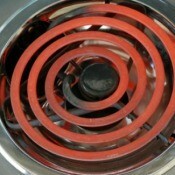 Cleaning Your Burner's Drip PansThis is a guide about cleaning your burner's drip pans. The drip pans on your range can get really messy. Once the spills burn on you have a challenging cleaning job ahead. 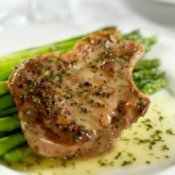 Pork Chop RecipesThis page contains pork chop recipes. There are many delicious ways of preparing pork chops using the oven, a skillet, or crock pot. 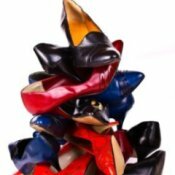 Saving Money on ShoesThis guide is about saving money on shoes. Buying shoes doesn't have to break the bank. 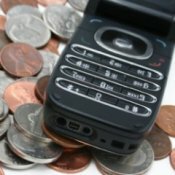 Saving Money on Cell PhonesThis is a guide about saving money on your sell phone plan. Trying to save money on your cell phone plan can be a confusing and exhausting process. Don't give up, there are ways to cost cut. Repairing Scratches on a Linoleum FloorThis is a guide about repairing scratches on a linoleum floor. Linoleum flooring is experiencing a renewed popularity due to its green composition. Should your flooring become scratched it can easily be repaired. Chicken Broccoli BakeThis recipe incorporates several tasty, as well as healthy, "everyday" foods. It's a treat that's not a wallet buster! It makes a great dish for freezing in portions for a fast reheat. Corn RelishThis is a great little extra to put on the table. So good you can eat it right out of the jar! Angel BiscuitsAngel biscuits are a cross between a roll and a biscuit. They are just like the biscuits in the refrigerator section of the grocery store - only better. They are an excellent introduction to yeast baking, and are very easy. 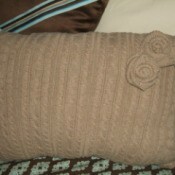 Sweater PillowDon't throw out those sweaters that no longer fit; instead, recycle them by creating throw pillows. This is a quick and simple craft. Leaf Blower for House CleaningThere are times when I have opened my doors and used the leaf blower to blow out dirt and dust from my kitchen, living room, and car. This sounds like a guy thing (I am not a guy), but it really feels uber-clean and you feel like a cleaning superheroine in the process. Note Library Due Date On BookmarkWhen you take out a book from the library, I always use a bookmark. I write the due date on a post-it note and stick it to the book mark, as I read the book and move the bookmark the date is always right there. Cremation Ashes For Family MembersAfter my husband passed away and was cremated, I wanted to have some of the ashes put in very small containers to give to his mom, his brother, his son, and his daughter. 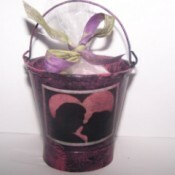 Decoupage Bucket of LoveMake this bucket of love for your loved one this Valentine's Day. 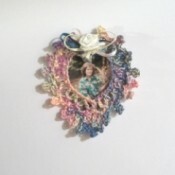 Mini Crocheted Photo FrameCrocheted with double strands of crochet thread, this mini frame is perfect for that special small photo. Decorating Your First HomeI've recently read several books on the aforementioned topic. I believe they are helpful to everyone, because no matter if it's our first residence or not, we all get desire to start over from time to time. List And Plan Errands To Save GasThe night before you do shopping, errands, appointments, make a list of all of them and times of appointments and addresses. Then add the addresses and look at a map of city and plan accordingly, for example "Dr.'s appointment 10 am". 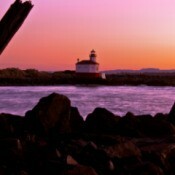 Historic Coquille Lighthouse (Bandon, OR)A few days ago, my husband and I got ourselves up about an hour before the sun began to rise. We got ready for the day and made sure to dowse ourselves in the shower to wake up, plus eat a little to warm up, before heading out to Bandon's South Jetty County park, allowing me to set up and get some sunrise shots! Software Recommendations: Malwarebytes and AVGInstall and activate Malwarebytes. It has saved my reinstalling my Operating System! Even if you get a virus you can boot into safe mode, activate it and remove the offender. Children's Crafts Relating to ScotlandI need an easy craft project for children studying Scotland. They are ages 5 to 8. Removing Chocolate Stains from WoolHow do I remove chocolate stains from woolen clothes? Removing Dried Paint from CarpetCan anyone tell me how to get white paint, that has already dried, off of dark brown carpet? Removing Toilet Bowl StainsHow do I remove a brown stain from the toilet? Buying Old Wood Windows for CraftsWhere do you buy old windows to decorate yourself? Freezing CarrotsWhat do I need to do to freeze carrots? Pet Urine Odor on Laminate FloorEmbarrassing question, but here goes. I have two Shih tzus who are older and have starting peeing on my laminate floor. Is there any way to get the smell out? They have ruined my floor, of course, but I can't replace it right now. Setting Clothing DyeMy niece bought me a homemade swimsuit cover from Cuba. It's red with cream knit edging. When I put it on the red stained my skin right away. What can I do to stop the red from going on to my skin? It's a beautiful top and I don't want to ruin it. Please help. Framing PuzzlesI like to work puzzles and then glue them. I'm wondering how I can frame them without spending a fortune? Pop Can Ring Net Pot ScrubbersMy great grandmother made these without crocheting. She used the metal rings from pop cans. Anyone know how to do this?